I’m not even going to dare to edit this down, because every word is dead on. I just want to note, that these words posted below aren’t mine. Vaneta Rogers is a talented writer over at Comic Book Resources, and I gobble up all of her columns. Likewise, Allan Heinberg and James Robinson is a talented writer and I admire his work very much. I’ve posted Roger’s section on Homosexuality In Comics below, but her entire article on diversity as a whole in the medium is worth a read. Do go on and check it out at CBR. 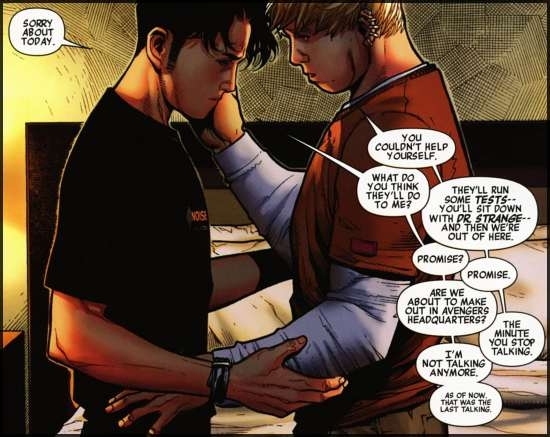 Another element of diversity that has been recently introduced into mainstream superhero comics is homosexuality. As Newsarama reported yesterday, even the Justice League of America has a gay male superhero whose boyfriend is also a crimefighter. Yet there does seem to be an odd disparity among gay crimefighters, because lesbian heroes outnumber gay men. You can read more of Roger’s thoughts on diversity within the comic book industry at Comic Book Resources.